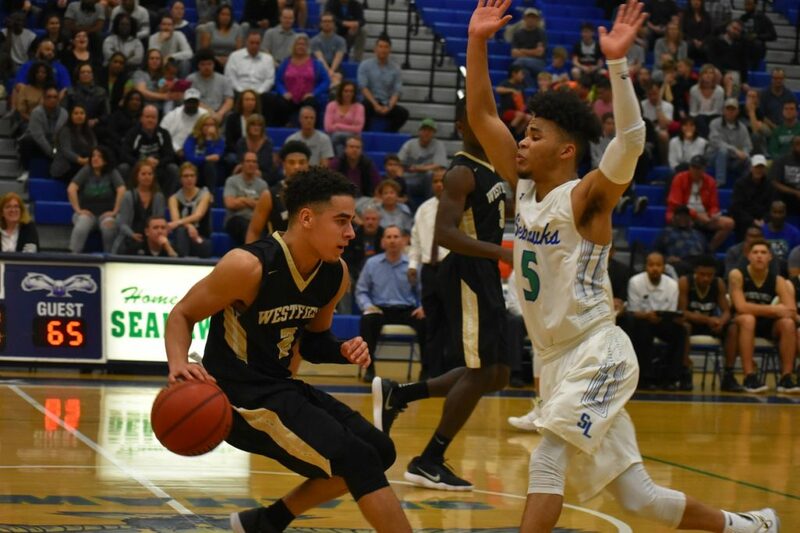 Nothing has come easy for the Bulldogs of Westfield in the 6D Regional Tournament, but after another grueling overtime game they’re still standing. Standing tall after an impressive 70-68 overtime victory on the road over Liberty District Champion South Lakes. 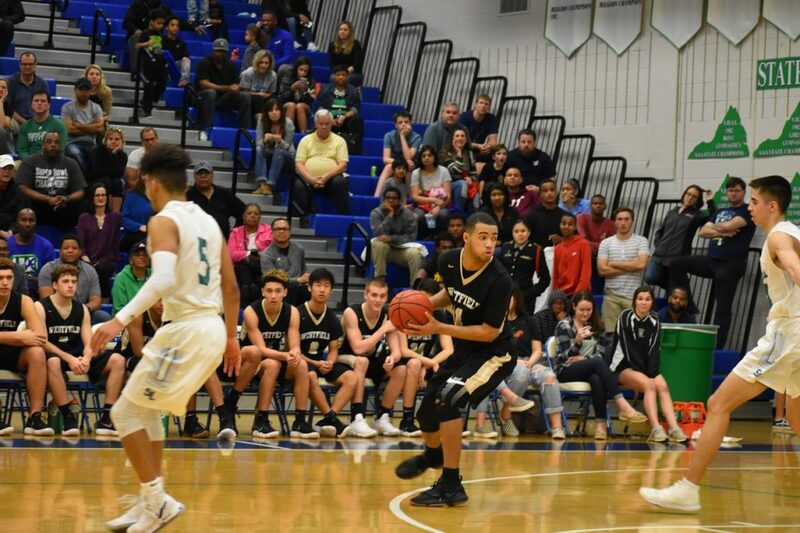 A night after a furious comeback delivered a victory over Stonewall Jackson, it seemed like the Bulldogs might be on the other side of the coin on Wednesday. For a good chunk of the first half Westfield led by double-digits, but South Lakes was able to claw its way back and take the lead in the fourth. The Seahawks even had a chance to win the game in regulation but a Cam Savage three-pointer was off the mark. South Lakes’ Cam Savage (17 points) puts defensive pressure on Westfield star guard Jordan Hairston. Despite the miss it seemed like the momentum was squarely on the side of the Seahawks as overtime began. The Bulldogs had other ideas. Junior guard Jordan Hairston hit a nice mid-range jumper to open the extra session. Junior Marshall Reed yanked down a rebound off a Seahawks miss and rambled down the court to find senior guard D.J. Gregory for a lay-up. After another defensive stop, senior forward Aaron Opoku tipped in a teammate’s miss. Westfield was up 65-59 and although a few missed free throws later created some anxious moments, South Lakes could not recover. Reed had a fantastic all-around game for the Bulldogs, scoring 24 points and also contributing 11 rebounds and five assists. When the Seahawks took a 55-53 lead midway through the fourth quarter he had two key baskets in a row to blunt the Seahawks’ momentum. There were many other heroes, however. Opoku had 13 points and seven rebounds off the bench and had two key free throws late in overtime. Gregory had 10 points and eight rebounds and Hairston nine points. Junior guard Taylor Morin, like the Bulldogs’ other guards, showed an impressive ability to defend and especially rebound, collecting 10 boards on the night despite only being around six-feet tall. Bulldogs junior Marshall Reed looks to drive. Reed led all scorers with 24 points. South Lakes was led by Savage, a junior and Liberty District Player of the Year, with 17 points. Seniors Damon Johnson and Emmanuel Aghayere contributed 11 points apiece for the Seahawks, who concluded their season at 19-6. 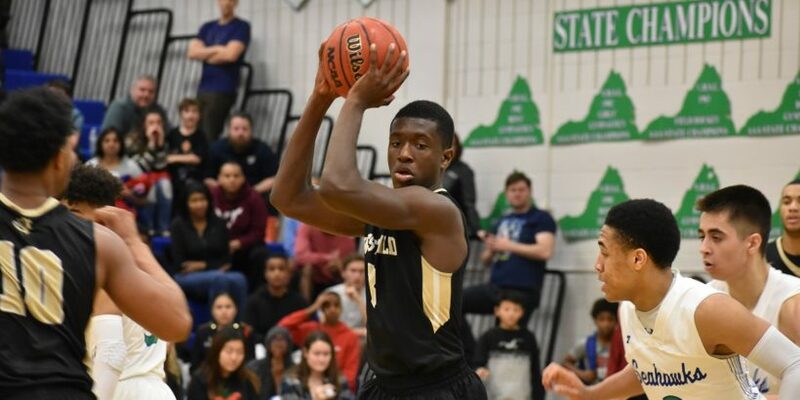 Westfield (15-9) now advances to play Concorde District rival Madison in the semi-finals of the tournament on Friday with a state tournament berth on the line.